The biggest problem with The Purge: Election Year is that its very existence is problematic. I will never proclaim to be a fan of the first film, but I appreciated its concept if nothing else; twelve hours during which all crime is legal. Logistically it doesn’t make much sense, but conceptually it’s an interesting way to explore the enforcements of laws, of right and wrong, and the circumstances therein. This is why I’m, if anything, somewhat forgiving of some of the flaws with The Purge, because that very concept is so attractive. I deem that it was a smart move to set the first film during the very first Purge Night, because the very concept is absurd, so why not almost celebrate that absurdity by exploring it for the first time? Nevertheless, we know how this story goes: film tries new concept, becomes an unexpected success (The Purge having grossed nearly $90m from a $3m budget), sequels are green-lit to maintain annual profit. This is where Election Year begins to break down, because, as previously stated, the core concept is completely absurd. Therefore, basing subsequent films on the logistics of an event such as Purge Night highlights flaws in the concept that are inescapable. You could argue that Election Year is supposed to be satirical and I imagine that, on some level, that was the intention. The problem is that the film is so idealistic with its right and wrongs that it becomes a joke unto itself. The purge could not work. Election Year attempts to rationalise the how’s and why's such an event could be continued (and I do respect the attempt), but the very idea is too ludicrous to be believed, even within the universe of the film. 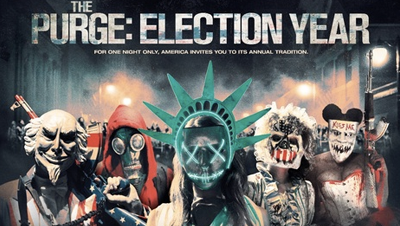 Election Year is based around an upcoming presidential election, and both candidates, as well as their voters, are concerned with only one thing: the purge. I feel that the only way in which to really push this conception is to create outright exaggerated caricatures of these candidates, where both go to complete extremes in order to win. And I could almost believe that this is what Election Year was intending, were it not for the straight-faced “saintliness” Senator Roan is portrayed with. As far as I can tell, Election Year is intended to be taken at face value, and this only works to its detriment. It diminishes what was initially an interesting concept by trying to rationalise it all within the rules and ways of the real world. But let’s say I’m completely wrong, that I’ve entirely missed the point. Even then, The Purge: Election Year is no better off. It’s contrived and poorly directed at best, and purges its very concept at worst.